Do you like games? Do you like fun? Can you make it to London South Bank University on the 6th May? 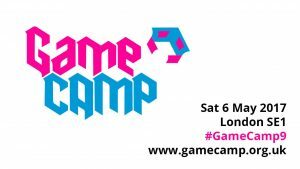 If your answer to all of these questions is “yes please!” you should probably consider coming to GameCamp. ‘Unconference’ means that anyone attending can give a talk (or panel/interview/roundtable) or run a game – you just pick a room and a timeslot and post it on the central board. You can even claim multiple slots if you like, and the board is open throughout the day, for instance if you feel compelled to start another conversation in response to something else you’ve seen earlier in the day. Attendance is not restricted to games industry professionals or academics – you just need to be curious about games. Nor is there any obligation to speak or participate in anything that doesn’t interest you – attendees are freely able to wander in and out of talks (provided they’re not too disruptive). From these you can get some idea of the variety of content on offer (although bear in mind I tended to favour talks about computer games over other stuff). On each occasion I have played something cool, learnt something useful, and met multiple excellent people. You can buy your ticket here! The ticket price covers a full day of activities (continued in the pub in the evening), an event programme, a surprise exclusive souvenir gift, and a canteen lunch with vegetarian option.